A tapir ( /ˈteɪpər/ tay-pər or /təˈpɪər/ tə-peer) is a large browsing mammal, similar in shape to a pig, with a short, prehensile snout. Tapirs inhabit jungle and forest regions of South America, Central America, and Southeast Asia. There are four species of Tapirs: the Brazilian Tapir, the Malayan Tapir, Baird’s Tapir and the Mountain Tapir. All four species of tapir are classified as endangered or vulnerable. Their closest relatives are the other odd-toed ungulates, including horses and rhinoceroses. Hybrid tapirs from the Baird’s Tapir and the Brazilian Tapir were bred at the San Francisco Zoo around 1969 and produced a second generation around 1970. Size varies between types, but most tapirs are about 2 metres (7 ft) long, stand about a metre (3 ft) high at the shoulder, and weigh between 150 and 300 kg (330 to 700 lb). Coats are short and range in color from reddish-brown to grey to nearly black, with the notable exceptions of the Malayan Tapir, which has a white saddle-shaped marking on its back, and the Mountain Tapir, which has longer, woolly fur. All tapirs have oval, white-tipped ears, rounded, protruding rumps with stubby tails, and splayed, hoofed toes, with four toes on the front feet and three on the hind feet, which help them to walk on muddy and soft ground. 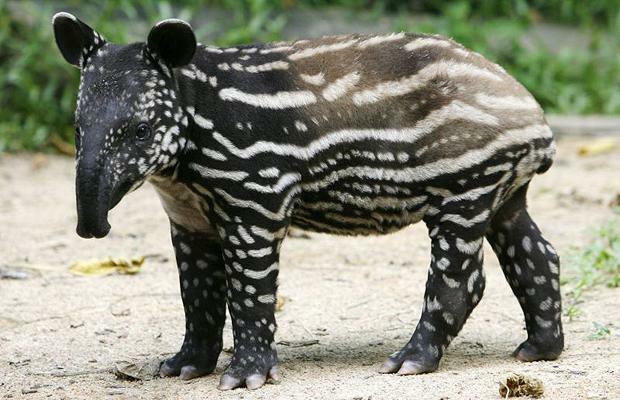 Baby tapirs of all types have striped-and-spotted coats for camouflage. Females have a single pair of mammary glands. The proboscis of the tapir is a highly flexible structure, able to move in all directions, allowing the animals to grab foliage that would otherwise be out of reach. Tapirs often exhibit the flehmen response, a posture in which they raise their snouts and show their teeth, in order to detect scents. This response is frequently exhibited by bulls sniffing for signs of other males or females in oestrus in the area. The length of the proboscis varies among species; Malayan Tapirs have the longest snouts and Brazilian Tapirs have the shortest. The evolution of tapir probosces, made up almost entirely of soft tissues rather than bony internal structures, gives the Tapiridae skull a unique form in comparison to other perissodactyls, with a larger sagittal crest, orbits positioned more rostrally, a posteriorly telescoped cranium, and a more elongated and retracted nasoincisive incisure. totalling 42 to 44 teeth; this dentition is closer to that of equids, who may differ by one less canine, than their other perissodactyl relatives, rhinoceroses. Their incisors are chisel-shaped, with the third large, conical upper incisor separated by a short gap from the considerably smaller canine. A much longer gap is found between the canines and premolars, the first of which may be absent. Tapirs are lophodonts, and their cheek teeth have distinct lophs (ridges) between protocones, paracones, metacones and hypocones. Tapirs have brown eyes, often with a bluish cast to them which has been identified as corneal cloudiness, a condition most commonly found in Malayan Tapirs. The exact etiology is unknown, but the cloudiness may be caused by excessive exposure to light or by trauma. However, the tapir’s sensitive ears and strong sense of smell help to compensate for deficiencies in vision. Tapirs have simple stomachs, and, like horses, ferment food in a large cecum. Young tapirs reach sexual maturity between three and five years of age, with females maturing earlier than males. Under good conditions, a healthy female tapir can reproduce every two years; a single youngster is born after a gestation of about 13 months. The natural lifespan of a tapir is approximately 25 to 30 years, both in the wild and in zoos. Apart from mothers and their young offspring, tapirs lead almost exclusively solitary lives. Copulation may occur in or out of water, and in captivity, mating pairs will often copulate multiple times during oestrus. Tapirs are generally shy, but when they are scared they can defend themselves with their very powerful jaws. In 1998, a zookeeper in Oklahoma City was mauled and had an arm severed after opening the door to a female tapir’s enclosure to push food inside. (The tapir’s 2-month-old baby also occupied the cage at the time.) In 2006, Carlos Manuel Rodriguez Echandi (who was then the Costa Rican Environmental Minister) became lost in the Corcovado National Park and was found by a search party with a “nasty bite” from a wild tapir. However, such examples are rare; for the most part, tapirs are likely to avoid confrontation in favour of running from predators, hiding, or, if possible, submerging themselves in nearby water until a threat is gone. Frank Buck wrote about an attack by a tapir in 1926, which he described in his book, Bring ‘Em Back Alive.